We all love roses. It may be the luxurious fragrances, rich colors or the elegant flower forms that attract us. It may be the memories that roses evoke. Whatever the reason, roses are one of the world’s most popular flowers. With so many different types of roses available, ranging from the diminutive miniatures to the towering climbers, there is no excuse to exclude this “Queen of Flowers” from your garden. 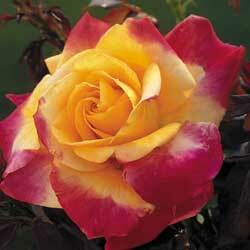 Hybrid Tea Roses: These blooms are a favorite of rose gardeners who enjoy long-stemmed, large flowers. 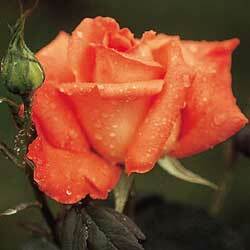 Hybrid tea flowers have many petals and plants grow upright and tall, about 3-7 feet. 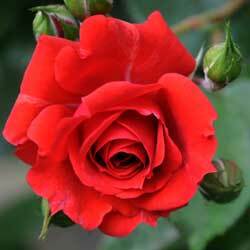 These roses are appropriate in either a formal garden or informal planting. Floribunda Roses: These roses have smaller flowers than hybrid teas with the flowers arranged in clusters. This rose bush is useful as a hedge for a border or privacy screen, and is equally stunning in mass plantings. Grandiflora Roses: These beauties were developed by crossing hybrid teas with floribundas. This rose grows to around 10 feet tall so it should be used in the back of the border where its beauty won’t shroud other plants. The flowers of the Grandiflora are hybrid tea form and can be single stemmed or borne in clusters depending on the cultivar. Climbing Roses: These roses make an outstanding vertical display when trained on arbors, walls, fences, trellises and pergolas and can grow from 8-15 feet tall. Flowers may be borne large and single or small and arranged in clusters. Miniature Roses: These delicate nymphs are dwarf in every way – flowers, leaves and height. This rose may be mass planted as a ground cover, used as border or grown in containers on decks, patios and porches. Shrub Roses: These flowers are renowned for their bushy habit and superior disease resistance making them an excellent choice for mass planting. The shrub rose flower may be either single or double. Some types have very showy rose hips. Old Roses: These luscious heirlooms are making a come-back! Although bloom times and color choices are limited, old roses are much more fragrant, vigorous and disease resistant than modern roses. To obtain all the qualities of an old rose combined with a long bloom time of a modern rose, look for the David Austin varieties. Not sure which rose is just right for your landscape or garden? Our rose experts will be glad to help you choose the perfect rose no matter what thoughts or emotions you want your garden to evoke. Stop in today to see the latest types of roses and the most popular cultivars for this year’s gardening.